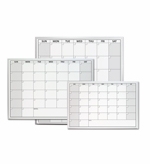 One month dry erase calendars provide you with a perpetual whiteboard calendar with day and date boxes that you can rewrite month after month for years. 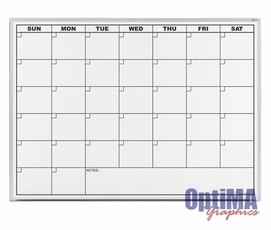 Our Opti-Print™ calendar graphics are embedded below the smooth dry erase surface so you know that it will never fade or wipe off. The 1 month whiteboard calendar is among our most popular offerings and it is available in a variety of different styles and sizes. You can get a wall mounted magnetic calendar, an economy framed non-magnetic white board calendar, as a refrigerator or one of our Opti-Print™ dry erase decals with or without our beautiful faux wood frames. 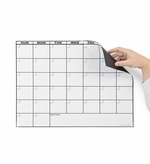 A great choice for anyone that wants a dry erase calendar where the size of the day boxes will be much bigger than those of a comparable size board with multiple months on it. From "Size" "203: 24\" Tall x 36\" W (+$99.95)" "304: 32\" Tall x 45.5\" W (+$199.95)" "" "404: 4' Tall x 4' W (+$275.00)" "406: 4' Tall x 6' W (+$375.00)" "408: 4' Tall x 8' W (+$475.00)"
From "Size" "203: 24\" Tall x 36\" W (+$72.95)" "304: 32\" Tall x 45.5\" W (+$129.95)" "" "406: 4' Tall x 6' W (+$299.95)" "408: 4' Tall x 8' W (+$359.95)"